HockeyPucks hiking and highpointing: Rocky Hill - 357 Ft.
From route 3A in Litchfield turn on to Albuquerque road and follow it 2.1 miles to the 4 way stop intersection. Turn left onto Hillcrest Ave. Parking is available on both sides of the road at 0.3 miles from the intersection. From parking on Hillcrest follow the trail into Litchfield Town Forest over a slight grade for approximately 0.15 miles. Turn right at the trail junction with the 4x4 trail and begin your ascent up a short incline. The trail levels slightly then begins a short and moderately steep grade before leveling out again before making a final push to the summit. At 0.15 miles you reach another trail intersection where a merge left will lead you to the highest point. There are 2 possible locations of the highest point. One is near the giant water tower and a second highpoint is approximately 100 feet away. I believe the wooded and rocky summit is a few feet taller than the point near the tower. There are no official markings and no views from the top. 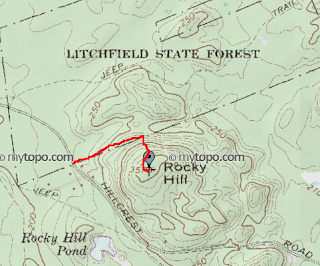 357 feet may not sound like a intense elevation however Rocky Hill is the highest point in the town of Litchfield. I was surprisingly pleased to find trails leading all the way to the summit but disappointed with the summit area itself and the lack of an obvious highpoint or knob. I wandered around in circles until I was satisfied the highest point was crossed. The trail travels through open woods and extremely peaceful. The left image shows the trail following an easy grade through open woods. The right photo is an image of the steepest section of the short trail. A water tower at the secondary summit of Rocky Hill.